Wilson Benesch The Full Circle review | What Hi-Fi? 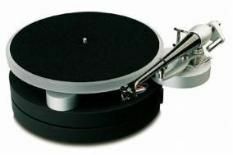 Wilson Benesch's The Full Circle is layered a bit like a sponge cake: the bottom slice carries the motor and power supply, leaving the next section to support the bearing and arm. Set-up is straightforward though, as with its rivals, changing the speed means you have to manually move the drive belt from one motor pulley to the next. An electronic option would be handy, particularly for those who switch between singles and albums on a regular basis. Wilson Benesch's Ply cartridge completes the Full Circle package. This moving coil cartridge doesn't have a body to cover its internals, so looks rather delicate – however, in use it's little different from the fully covered opposition. Properly sited on a dedicated hi-fi table, the Full Circle shows its class: this is an open, even-handed record player that works well with all types of music. It digs up plenty of detail and arranges information into a cohesive and musical whole. The presentation isn't flashy in any way, and won't grab the attention with seismic basslines or brain-pounding punch. What it will provide is a clear and insight view into the recording, so letting the music do the impressing. The Full Circle is an elegant product: for its build, ease of use and sound it's highly recommended.